Today I wanted to chat about my experience living off campus this year thus far. 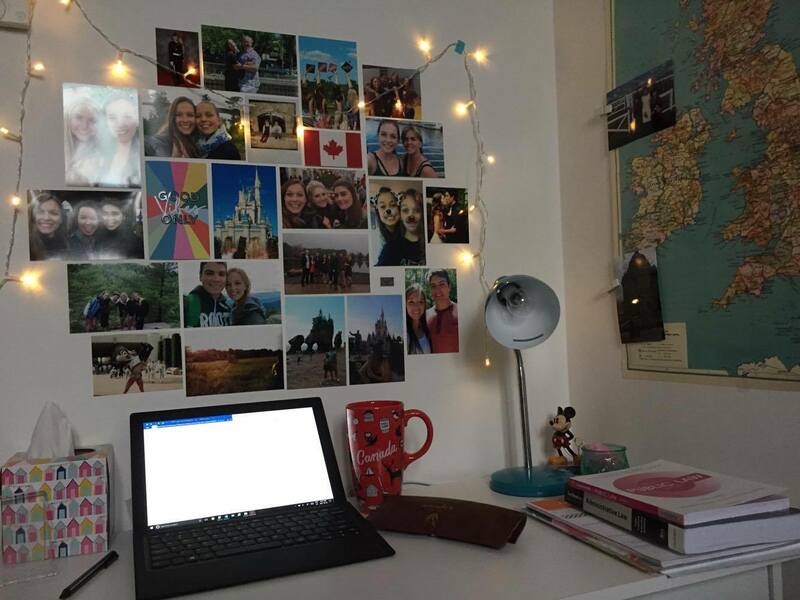 If you are coming to Surrey for a Master’s program, then you can apply to stay in University accommodations for your entire year in Guildford. If you are coming for a regular program, such as the LLB, then you can apply to stay in University accommodations for your first academic year but will have to find off-campus accommodation for the rest of your program. Although I found the whole process of finding a place off campus quite daunting at first as I had never gotten myself into a lease before and I was nervous that I didn’t have the information I needed to make a good decision (such as what is typical prices for students, what areas should I avoid, etc. ), it finally wasn’t as difficult or nerve-raking as I had feared. First, my cousin Gabrielle, my classmate Salvatore and I agreed that we wanted to find a place together. Knowing who I wanted to live with was already a huge weight off my shoulders. Although many students go out and find places on their own, given that we are all Canadian, we decided to get in contact with a Real Estate agent who took down our budget and wishes. This made the process so much easier. Our agent took us to one apartment where some Surrey students were already living and right away we knew this was it. The high ceilings, the two bathrooms, and the large kitchen with sofa meant for so much more breathing room than our previous dorm rooms. Although our place has its quirks, we are really happy with the decision we’ve made. We are currently living in town – a four minute walk from the movie theater, a two minute walk to the grocery store, another four minute walk to the bus station, and a six minute walk to High Street. We are a bit further from the University now, about 20 minutes, and we are much further from the Sports Park. However, I decided to get a bus pass to get myself to football at the Sports Park which takes about 15 minutes and I sometimes use it to get to Uni or home on rainy days. I did also want to warn you ahead of time of some of the things to keep in mind when considering moving off-campus and choosing a place to settle on. First, many places are unfurnished. This needs to be accounted for in your budget as it can cause a dent in your bank account quite quickly and can also mean having to sleep on the floor if you don’t time your move correctly. I decided to buy my furniture through Asda – although there was a hiccup with delivery, I am quite satisfied with the items I’ve received. I purchased a desk, a small library and two open clothes-rack. Luckily there was a bed and a desk chair left in the apartment which my flatmates allowed me to take. My flatmates ordered through Ikea and are also quite satisfied with their purchases. Second, most of the leases are 12 months and start in September. Because my flatmate Salvatore was going to be staying in Guildford for the summer unlike Gabrielle and I, we decided to have our lease start mid-June 2017 and end mid-July 2018. This allowed Gabrielle and I to move all of our stuff from dorms to our new apartment and not have to worry about summer storage. The reason we extended to July is that we will be graduating at that time thus giving us a place to stay. Third, although this might depend on your landlords, international students need to pay the year rent upfront (or in our case in two payments) as we do not have a UK guarantor. This can be problematic if you do not have that kind of money right away. This needs to be accounted for in your budget plan. Fourth, continuing on the topic of money, living in Guildford is expensive as it is a pretty great place to live given it’s proximity to London. Furthermore, it is very difficult to find a place that will cost you what University accommodations cost. Especially given that the utilities such as gas, water, electricity, and internet are not included. So something to keep in mind when looking for a place. Finally, some last recommendations are to work with an agent and to start looking early. We went with Foxtons and have been happy with their services thus far. Although you may have more experience then I did when first looking for a new place, this is a different country, in a new town that has a higher end market. As you don’t want to have to be looking for a place to rent from home, make sure you start looking early – you’ll also have a better chance of beating out other students who will also be looking. Also, make sure you tell your agent if you are a graduate student as some landlords will only rent to older students which opens up more possibilities. The University Accommodation Services is a great resource to help you through this entire process so make sure to check them out: https://www.surrey.ac.uk/accommodation. I hope this can be helpful to you when considering living on or off-campus. You can check out my blogs about University accommodations as well for more insight on that option.